Iperius Console is the software that allows to monitor all your backups made with Iperius Backup, along with the possibility to start and schedule them remotely in a few clicks. 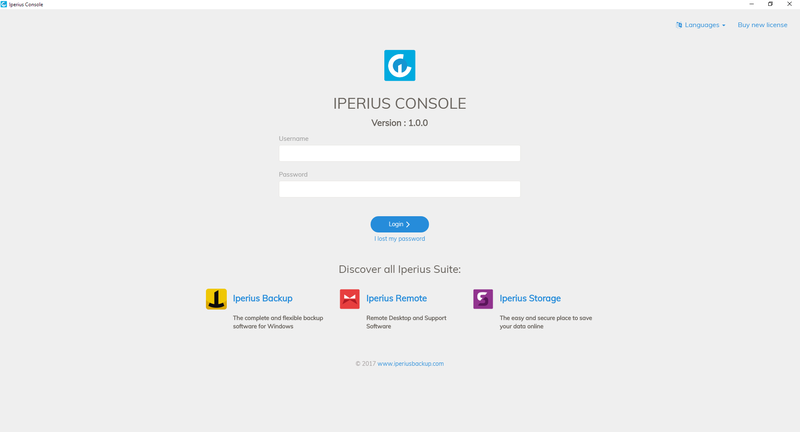 With Iperius Console, you can also view information about connected PCs and group them into Workgroups, also interfacing directly with other products of the Iperius Suite, such as Iperius Remote and Iperius Storage. 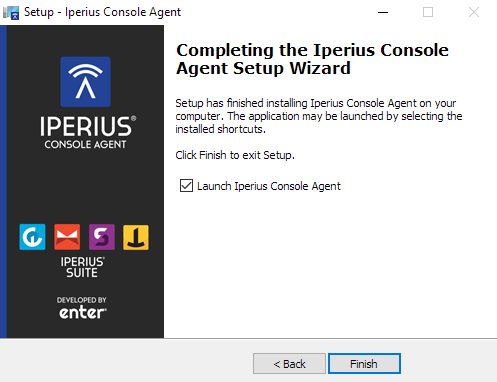 Once the purchase is completed, or if you already have an Iperius Console license, you can go on with the installation of Iperius Console Agent. Before going on with the tutorial, please note that Iperius Backup MUST be updated at least to version 5.4.1 !!! 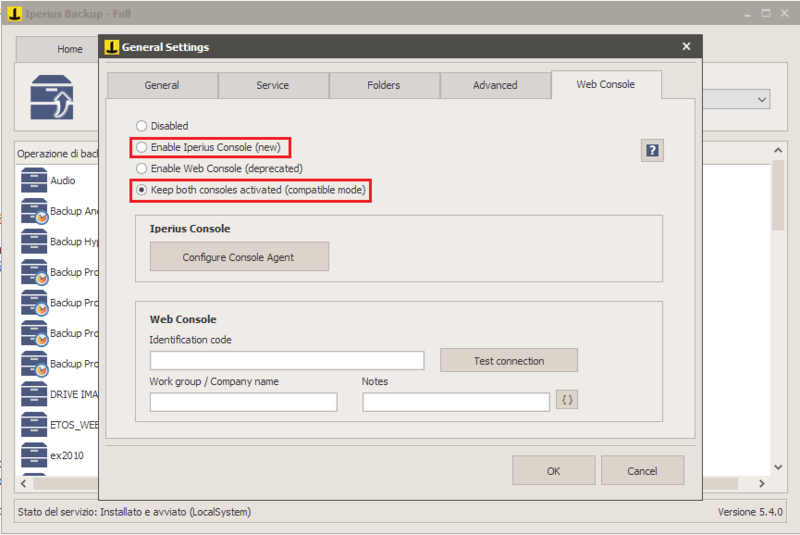 Alternatively, you can download and install it directly from Iperius Backup, inside “General Settings” , within the “Console” tab, by checking either the option “Enable Iperius Console” or “Keep both consoles activated”, and then clicking the “Configure Console Agent” button (see next image). 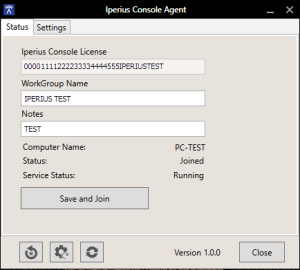 After completing the setup step, following the detailed instructions, a further window will now be displayed, allowing a fast configuration of the Iperius Console Agent before it starts (see image below). 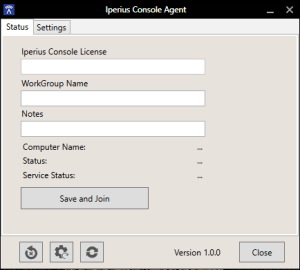 If you already have an existing connection between Iperius Backup and the previous version of the console, the program will automatically retrieve license, workgroup, and notes, filling up the text boxes and speeding up the installation and configuration of the agent. 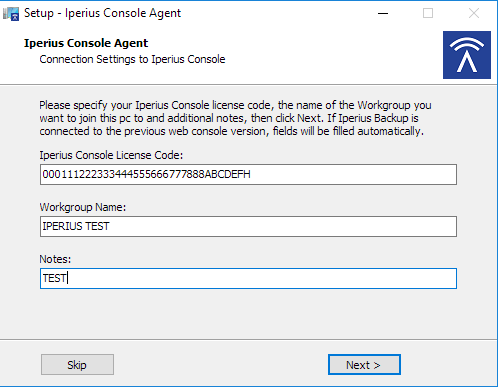 After you enter the license code and the workgroup name, just click Next to complete the installation (in the last window, you should check the “Start Iperius Console Agent” option). This will make Iperius Console Agent start immediately and, if license data have been configured through the installation, also directly connect to the console, showing a message of successful connection made. 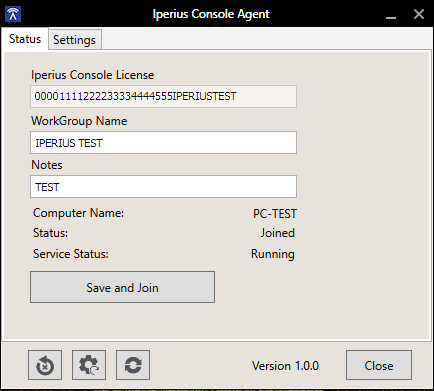 If the configuration hasn’t been made within the setup (using the “Skip” button), the program will show the “Iperius Console License” and “Workgroup Name” text boxes both empty (see image below) and editable, as well as “Computer Status”and “Service Status” , which will indicate “Unconnected” and “Not Installed” . 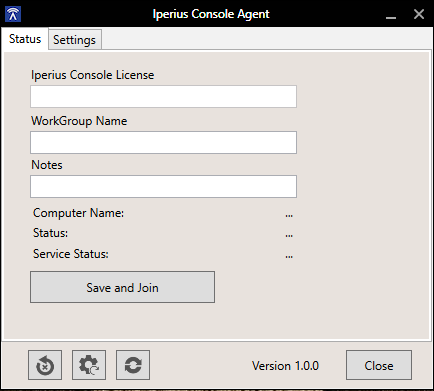 Now, just enter the license data and the workgroup name (and any additional notes) in the respective boxes, then click “Save and Connect” to directly connect the PC to the Iperius Console. If the process ends successfully, you will see the same screen you would see if you’ve done the configuration inside the setup wizard. PS: In the case of PCs connected to the network through proxy, you can set the proxy address and credentials inside the Iperius Console Agent options tab. 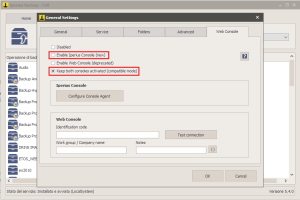 Let’s go to the next step, where we will describe how to enable Iperius Console inside Iperius Backup. 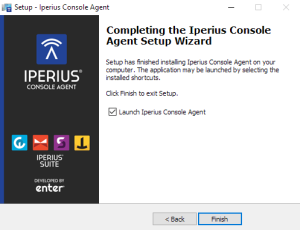 For those who have installed the Iperius Console Agent directly from Iperius Backup, you can skip this step and go directly to step 3 of this guide, since enabling notifications has already been performed during the first phase. To enable notifications, just open the “General Settings” menu of Iperius, click the “Console” tab and check the “Enable Iperius Console” option if you want to use just the new console, or the “Keep both consoles activated” if you want to use both the consoles, old and new (see next image). 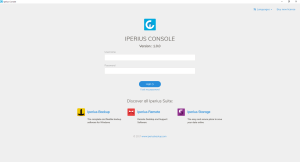 At this point, we can go to the last step of our guide: the installation of Iperius Console and the first login in the renewed console interface. 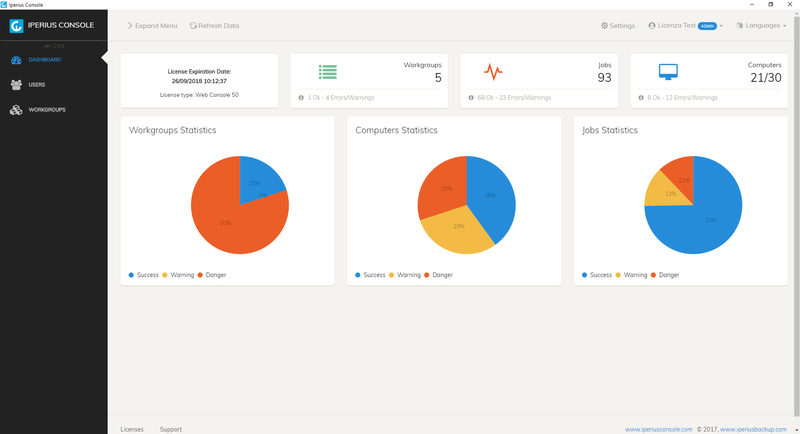 Once logged in, you can now take advantage of the many remote monitoring and control features that Iperius Console provides, including Iperius Backup backup and updating remotely, changing backup scheduling times, and of course the Complete view of the results of all backups for which notifications are enabled to the console. Does the console also works with the free backup version ? No, to work with the Console you need at least the Desktop edition. for technical support, please open a ticket on https://support.iperius.net.